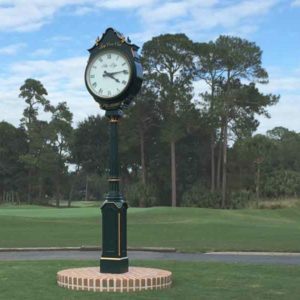 From the historic Greenbrier to the breathtaking vistas of Pebble Beach, Electric Time Company has provided post clocks to the most iconic golf clubs imaginable. Golf courses world-wide enjoy the elegance and practicality of Electric Time’s two dial and four dial street clocks. Waiting for your tee time? Check the Electric Time golf course clock. Their outdoor clocks can be found at the first tee, at the clubhouse or simply on the golf range. They take special pride in the accuracy and dependability of the clocks. Enjoy another round – you have time! Looking to honor a long-time member of the golf club or thank your club’s golf pro? Cast bronze dedication plaques can be added to the clock posts. 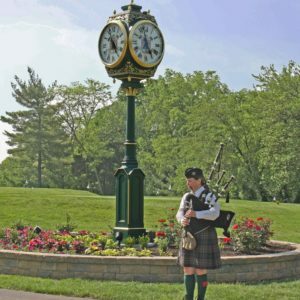 A golf course clock is the perfect way to leave a lasting legacy. Sturdy cast aluminum is used for both the Two Dial Post Clocks and the Four Dial Post Clocks. No power at the site? No problem. Electric Time clocks are available in electric and battery versions. Follow the lead of the most prestigious golf organizations – be it a public or private course, use an Electric Time Company golf course clock on your property. Need a tower clock for your clubhouse or pro shop? 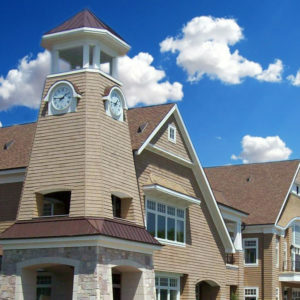 Electric Time Company can help you choose the correct style and size for your building. Customize a standard design or create one from scratch. Either way you will have a high quality, custom timepiece to enhance your golf club. Contact Electric Time for pricing, drawings and design assistance. Window Clock: I can see clearly now…. Easy Installation – Its Time for School!